Dr.Bob's Programming Clinic is an Award-winning website containing the latest news, press releases, technical articles, book reviews, freeware tools, third-party tool reviews, and news on conferences and training events for Borland Delphi, C++Builder, JBuilder and the upcoming Kylix. For more BorCon 2001 news check out BorCon reports by other people, such as the Dutch SDN or BYTE.com. Today, we arrived in Long Beach (after a long trip). Registration brought some welcome surprises already: no ordinary conference bag, but a small backpack, a conference t-shirt, a book by Guy Kawasaki (Rules for Revolutionaries) and no less than seven CD's included (the Conference CD itself, a Delphi 6 Enterprise Trial Edition CD, a Kylix Server Developer Trial Edition CD, an InterBase 6 Multiplatform Trial Edition CD, a JBuilder 5 Enterprise Trial CD, a JBuilder Personal and MobileSet Nokia Edition CD and finally a Borland Professional Services CD (containing only a single 754,688 byte PPS presentation). Unfortunately, only about half of the 200+ session papers are present on the "Conference Edition" of the BorCon 2001 Proceedings CD. Updates will be made available (to BorCon visitors) on the Borland website as well as a Post Conference CD, but I would like to see more papers in time for once! Perhaps to make up for the missing session papers, the Conference CD also contains 24 CD-only papers, videos of previous BorCon Opening Keynotes and more goodies. 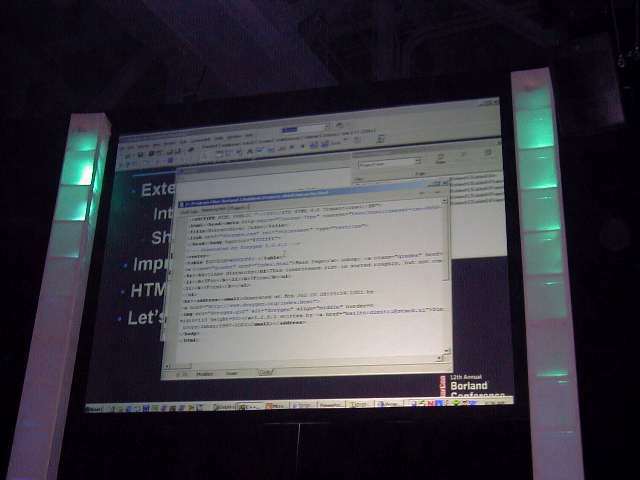 The Opening Keynote started with a not-so-big Inprise sign on stage. The lights went on while music from the 2001 movie played (also Sprach Zarathustra) and a big apeman entered stage. The apeman used a stick (the first tool) to demolish the Inprise sign. Then, when the music went to its climax, the back-lights went on and a much bigger Borland sign appeared. Then apeman undressed, and of course it appeared to be DavidI, Borland's vice-president of developer relations. He welcomed us all to BorCon 2001. He was then interrupted by a computer voice... of Dale 9000. Dale 9000 went operational on May 2, 1983. His first instructor was Philippe Kahn (the only Borland President/CEO who "outlived" Dale Fuller at this time). Dale and Dave had a little dialogue, until Dale interrupted with a message that something went wrong with a creditcard verification EJB (Enterprise JavaBean) that would fail in five minutes. The cause was clear: the Dale 9000 computer make no mistake, so it must have been a human error. The only possible fix that the Dale 9000 computer could come up with was a new release of the software written using only Borland tools. And that started the official demo of the Movi-E-Tailer, which is written in Delphi, Kylix, C++Builder, JBuilder, VisiBroker, AppServer and AppCenter (hope I haven't missed one). Dale Fuller entered stage and talked about Borland (back with a vengance). Dale also invited representatives of Borland's RAD, Java, Enterprise and InterBase business units, each demonstrating how Borland tools were used to implement the Movi-E-tailer e-commerce website. The new announcement that was made ("How were we able to make this using all thee different tools in so little time?") was TeamSource DSP (Development Services Platform). A number of sessions on TeamSource will follow this week, and I'll take a closer look to find out whether or not this collaborative development platform for distributed teams will enable me to telework from home (with people from all over the world)? Monday features the Product Addresses and Meet-the-Team sessions. The RAD Product Address (of Delphi, C++Builder and Kylix) was done in a single session (thank you Borland! ), on Monday from 8:00-9:15. It started with an overview of Delphi 6, then went on with Kylix and C++Builder 5. We also saw a little preview of C++Builder 6 by JT Thomas. One of the best things is that Code Insight has improved significantly (it's almost as fast as Delphi now). Also, C++Builder 6 will of course contain all the Snaps (DataSnap, WebSnap and BizSnap) as well as CLX support. I've heard the name " C++Builder for Linux" (instead of "Kylix C++ Edition"), but I'm not sure what the official name for that particular edition will be. They are however working on C++Builder 6 for Windows as well as a Linux version, that much is certain. The C++Builder 6 IDE preview that was shown contained some toolbar stuff (to integrate external tools in the IDE). JT also showed some HTML editor code completion which was very nice (I bet that will also be used in some of the other Borland RAD tools like Delphi and Kylix). Personally, I would expect C++Builder 6 to be released around the end of this year, but we have to wait and see. It's good to see that it won't just be a catch-up game with Delphi 6; it's more like a leapfrog again! I wasn't able to see all details very clearly, because I had to wait backstage (together with Ray Konopka, Nick Hodges, Marco Cantu, and Xavier Pacheco). The last bit of the RAD Product Address was done by the new marketing manager of Borland (Alison Duane). She played the host of the last part of the session, featuring... The Weakest Link! It was a lot of fun, and after we've sent Xavier (the shortest link), Marco and Nick away (in that order), Ray Konopka and I even had to resort to "Sudden Death" (after the last round ended in a tie) in order to decide who of us would be the Strongest Link. What's the decimal value of 10 hexidecimal? There is no excuse for the "unlucky" answer I gave (a correct one would have made me the Strongest Link). 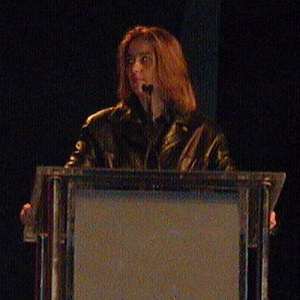 At it is, Ray Konopka won the Weakest Link award (congratulations). Today, Borland also announced a new version of the Enterprise Studio for Java - including JBuilder 5, of course. Mark "Madman" Miller must have spend days, weeks if not months preparing for his evening session "The Dark Side of Delphi". I must admit, Dr.Bob's Hat Remover (tm) works pretty nice - especially if you consider that I haven't been wearing The Hat for the past few years now (not since Tasha started to play with it, that is). One of the best things I did (in my efficiency session) was to show how we can profile a " Web App Debugger"-enabled web server application using Sleuth QA Suite 2's profilers. Also, anyone who ever attended one of my annual BorCon Delphi Efficiency sessions will remember that the most important subject of performance optimisation (apart from finding the bottle-neck) is often the algorithm and/or data stucture used. Consequently, it shouldn't come as a big surprise that I've been really impressed by to Julian Bucknall's book Tomes of Delphi: Algorithms and Data Structures, published by WordWare, available from Amazon.com (with a great 30% discount). And now I should start working on the call-for-paper submissions for next year (which closes on August 31st). There's also a new PDF white paper on Migrating Your Delphi 5 Projects to Kylix written by me for the Borland Community website. The paper provides an overview and detailed description of migrating applications from Borland Delphi 5 for Windows to Kylix for Linux. Last year was the first time that I was able to attend the closing session. This year, however, I'll be flying home again when the closing session starts - my colleagues (Arjan Jansen and Arnim Mulder) will send me a report of the latest news, which will be available here shortly after the conference. This webpage © 2001-2015 by Bob Swart (aka Dr.Bob - www.drbob42.com). All Rights Reserved.